This week we bounce back down to the lower 48 states to learn about some Edmontosaurus fossils in the collection of artist and paleontology enthusiast Olof Moleman. Hello there, I’m Olof Moleman from the Netherlands. Ever since I was a child I’ve been either making stuff or learning about something. I’ve studied Game Art and I also love modding games. But probably my main hobby is collecting fossils. At a very early age I got fascinated by dinosaurs and other prehistoric creatures. When my dad gave me his modest fossil collection at the time, this sparked a renewed interest and the collection grew over time. So now I have countless fossils from all over the world of all sorts of interesting prehistoric creatures, from the woolly rhino to the giant predatory Spinosaurus. But what I love most is learning about these ancient creatures, and subsequently sharing this knowledge. And with the technology of photogrammetry and the internet it’s never been easier to share what can be learned from these fossils. So I have been scanning a number of fossils from my collection so that everyone can view them at their leisure. One such fossil is a rather nice partial jaw of a young Edmontosaurus. There are many fantastic dinosaur fossil sites in North America, but one that might be one of the best known is the Hell Creek formation where this fossil was found as well. The Hell Creek formation is spread over 4 States, Montana, Wyoming, North Dakota and South Dakota. It’s named after deposits along Hell Creek in Montana. The Hell Creek formation has deposits from the end of the Late Cretaceous period, some 66 million years ago. This is just before the dinosaurs went extinct. This area is known for many famous dinosaurs such as Tyrannosaurus rex, Triceratops, Ankylosaurus and Pachycephalosaurus. There were also raptors like Dakotaraptor and Acheroraptor as well as gigantic Pterosaur Quetzalcoatlus. Edmontosaurus, like Triceratops is one of the bigger plant eaters from this area. It was also one of the main food sources for T. rex. Fossils have been found of Edmontosaurus with healed bite marks on the tail that could only come from T. rex. This is how we know that T. rex actively hunted Edmontosaurus. Some fossilised mummies have also been found of Edmontosaurus with preserved skin and scales. So we know quite a lot about what this animal looked like. Edmontosaurus was a large herbivorous dinosaur that belonged to the Hadrosaur family (the duck-billed dinosaurs). It was roughly the same size as T. rex at around 12 meters. Though some evidence exists that some individuals might have become even bigger. It had a thick scaly hide, though it didn’t possess any other protection against predators like some other dinosaurs had. To prevent getting eaten it’s likely this dinosaur lived in herds. It’s also one of the most common dinosaurs in the Hell Creek formation, though it is not exclusive to this area. It’s also common up north in Canada where this dinosaur was named after Edmonton. Now, the fossil specimen I’ve featured here is a partial dentary bone, which is largest bone in the lower jaw, of a young Edmontosaurus. It’s less than half as big as a full grown Edmontosaurus. For the scan I’ve also made a mirrored copy to create the right half of the jaw as well, which is in solid beige. In the middle of the fossil on the inner side there are a series of ridges. This is where a whole battery of teeth would have been. Edmontosaurus was one of the few dinosaurs that could actually chew its food. Not like we chew our food though. We can move out jaws from side to side. No dinosaur could do this, instead, Edmontosaurus moved its jaw forwards and backwards as well as moving aside the bones of the upper jaw in its skull. So these animals had a feeding mechanism quite unlike any animal we know today. 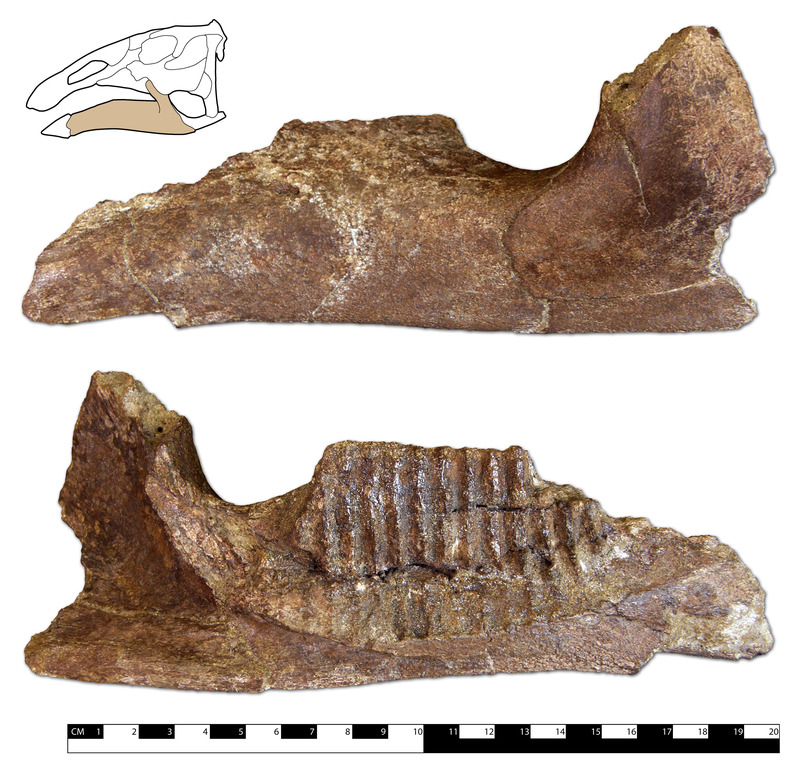 The flattened curved part on the posterior side of the specimen is where much of the jaw muscles would have been attached. Here is another example of an Edmontosaurus fossil from my collection that I scanned, a caudal vertebra. So this is from somewhere in the back of the tail of the animal. These fossil scans don’t make themselves of course. I learned about photogrammetry a few years ago. 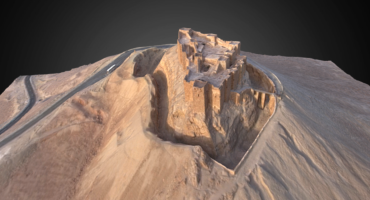 But only later did I find out that one can get into photogrammetry with using free software. 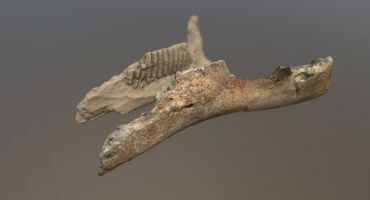 I came across this interesting thread on a fossil forum I frequent where someone tried out photogrammetry for the first time and described the process. Having a fossil collection of my own, I decided to try photogrammetry myself as well. And it quickly grew into a large extension of my hobby. So I start with a fossil, and depending on the size I will either move the camera, or move the fossil itself on a simple pottery turntable. I make sure to make the background as bland as possible so that pretty much only the fossil is present in the photo. I generally use black or white cardboard for this. Depending on the complexity of the fossil I take anywhere from 40 to 300 photos of the specimen. I generally make two rounds of photos, once with the piece right side up, and a second round with the underside visible so I can get all the angles of the fossil. 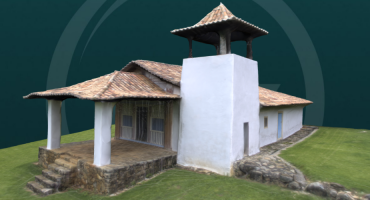 Once all the photos are on my pc I load them up in VisualSFM a free programme that makes point clouds. The computing process can take anywhere from a few minutes to several hours. Once I have a point cloud to work with, I switch to the programme CloudCompare. Here I clean up the point clouds, because often there is a lot of noise that needs to be removed. Once all the noise artefacts are removed I move the cloud that represents the underside of the specimen and line it up with the main cloud. I then do a Poisson Surface Reconstruction to create an actual mesh. I then import the mesh and the main point cloud into MeshLab. The point cloud still has all the data for the photo positions, which I use to project a texture onto the mesh. If needed I’ll sometimes clean up the texture file a little in Photoshop by tweaking the colours or removing shiny highlights. And then it’s done and I’ll have a nice digital representation of a fossil from my collection that I can then share with the whole world. To see more of Olof’s models here on Sketchfab, check out his profile!